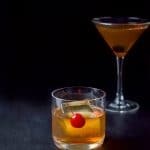 This classic bourbon Manhattan recipe is dedicated to my friend, Alex, in Maine, who loves the cocktail’s delightfully sweet taste when the bourbon and vermouth are properly balanced. One day on Facebook, I asked the question: What cocktail do you want to see me make for the blog? I got some good answers and the one I chose for this week was the delightful bourbon Manhattan cocktail. 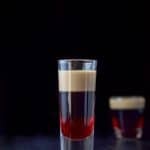 When Alex proposed this recipe, I had already posted a whiskey Manhattan and a Southern Comfort Manhattan, so I asked him if he still wanted the bourbon Manhattan. So here it is! But before I go into the recipe . . . I didn’t start watching the show Mad Men until at least season 3. I binged watched a few seasons and what stuck with me was how much the characters drank. Hey, no judgment from me! As you all know, I love a good cocktail. Or wine, or beer, or . . . So, there is Don Draper, holding a bourbon in his hands and even though I thought I didn’t like bourbon, he inspired me to pick up a bourbon nip the next time I went to the liquor store. You better believe that I cracked open that bourbon nip and poured it into the appropriate glass the next time I watched the show. I sat there taking mini sips as I watched them drink glasses of scotch, tumblers of bourbon and the ever present martini! My first few sips, I can’t say that I didn’t screw up my face. What I can say, is the more I sipped, the more I liked it. Buy the best bourbon you can afford. To me, you can taste the difference when you make a cocktail with a premium liquor or what we called “top shelf” in the bar where I used to work. It’s especially important in a cocktail like this since there are basically only 2 ingredients. That means you can more easily taste the difference. If you can, get some fun bitters. I purchased Woodford Reserve flavored bitters. The package arrived with 4 different flavors: spiced cherry, orange, aromatic and chocolate. I’ve used them all and they’re delightful, but my favorite is spiced cherry. 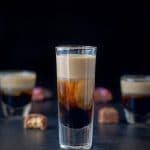 This recipe calls for 5 drops for two cocktails, but I usually use 10 for two drinks. You need to play around with the amount of bitters to see what suits you. If you don’t have fancy bitters, it’s perfectly fine to use Angostura or any other bitters. 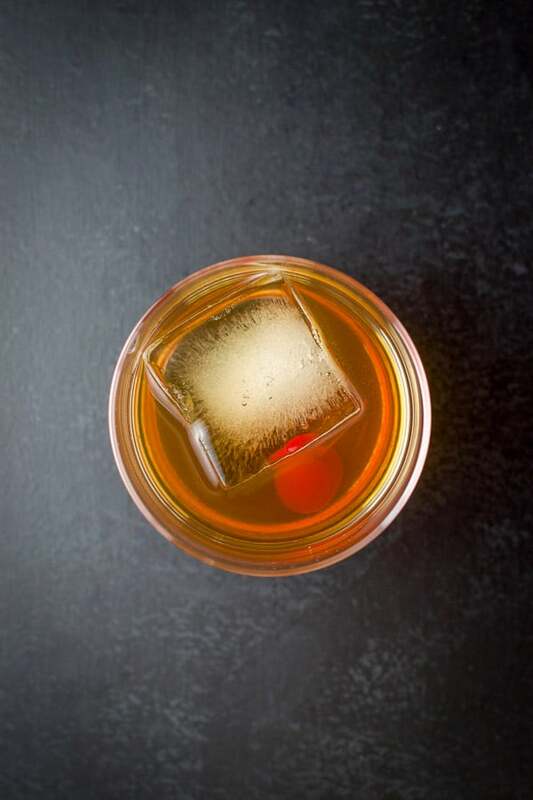 You can serve this Manhattan straight up or on the rocks. I like mine straight up and served in a martini glass. My mother used to drink her Manhattans on the rocks. Whenever I use maraschino cherries as garnish, I rinse them off so the juice they are stored in doesn’t infiltrate the cocktail. Get a cocktail shaker and fill it halfway with ice. Also take out your glasses and 2 cherries for the garnish. I happened to use one regular maraschino and a Luxardo cherry. 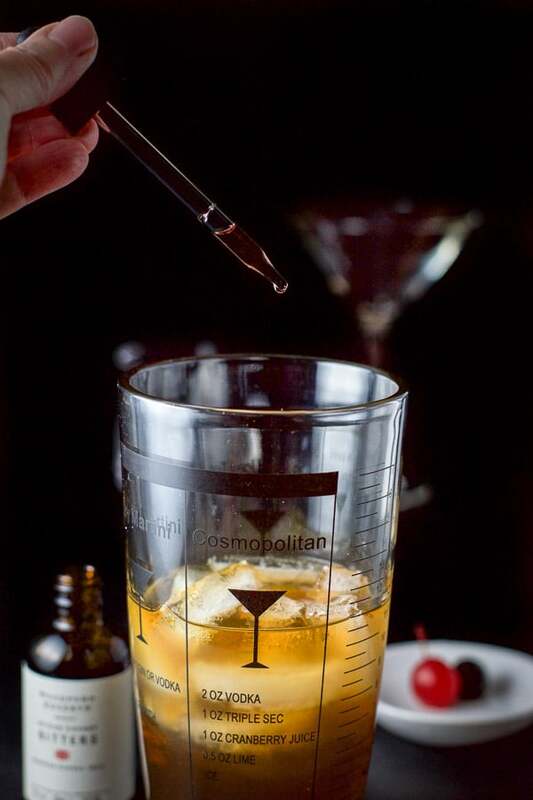 After you measure out each ingredient, pour it into the cocktail shaker. 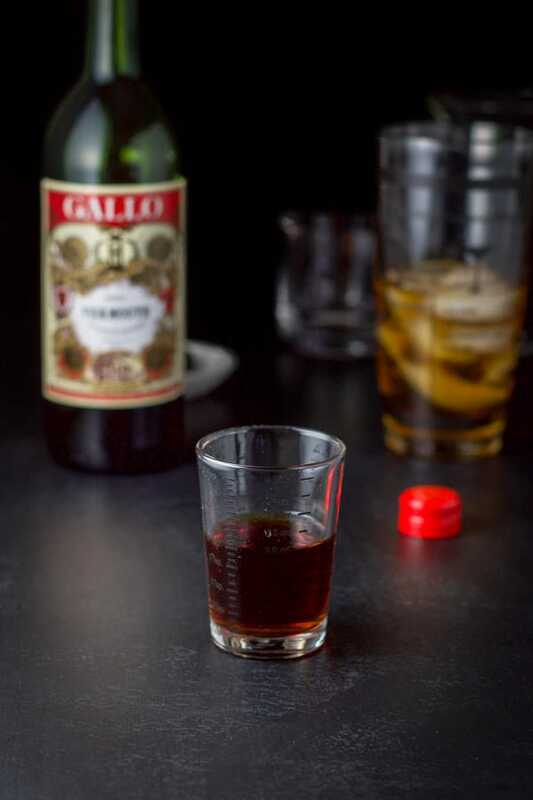 Gather the ingredients – bourbon, sweet vermouth and spiced cherry bitters. 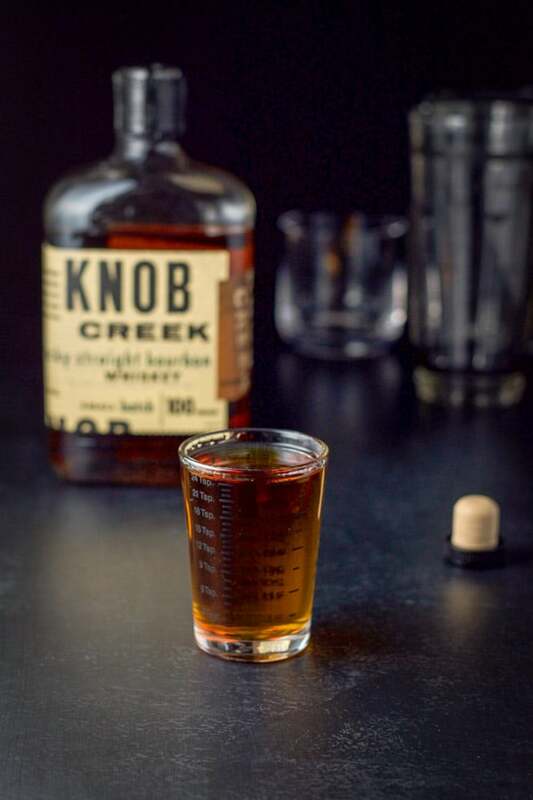 Measure 4 ounces of bourbon. Measure 2 ounces of sweet vermouth. If you use Angostura bitters, shake 5 drops in the shaker. 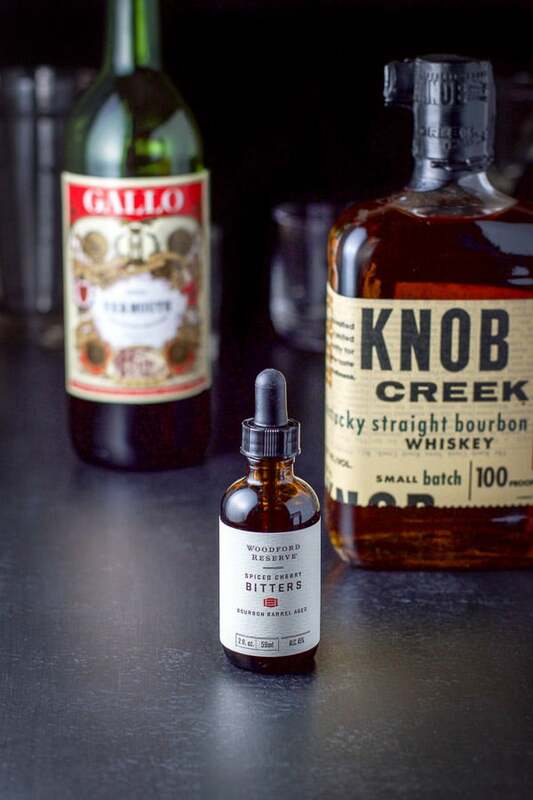 If you use Woodford Reserve bitters, which come with a dropper, squeeze 5 – 10 drops in the shaker. You may have to play around with the amount of bitters, but I’ve found 5 drops per cocktail is perfect, especially when I use the spiced cherry flavor. Cap the cocktail shaker and shake for 20 seconds. Place a big ice cube in the double old fashioned glass and leave the martini glass naked. Strain the contents between the two glasses. Place one cherry in each cocktail. Let’s see the martini glass filled with this bourbon Manhattan. Let’s look at an overhead view of the double old fashioned glass. Here’s a vertical shot of the lovely drink. 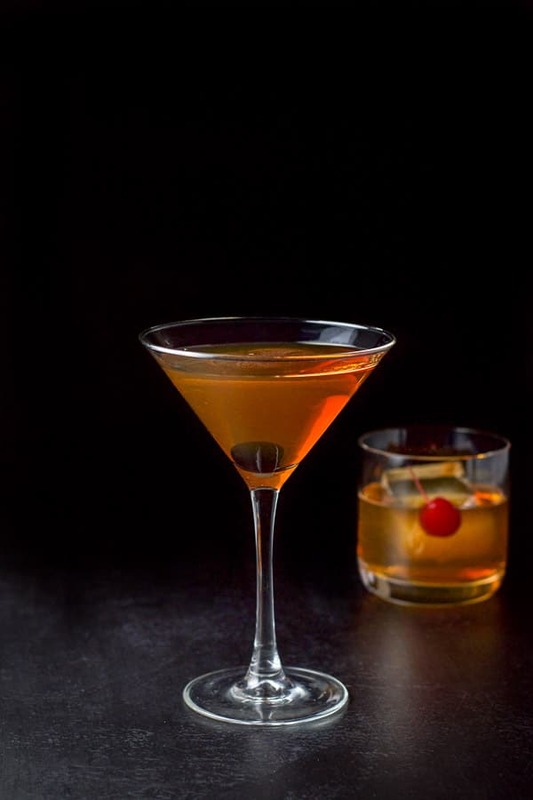 I hope you enjoyed this bourbon Manhattan recipe. 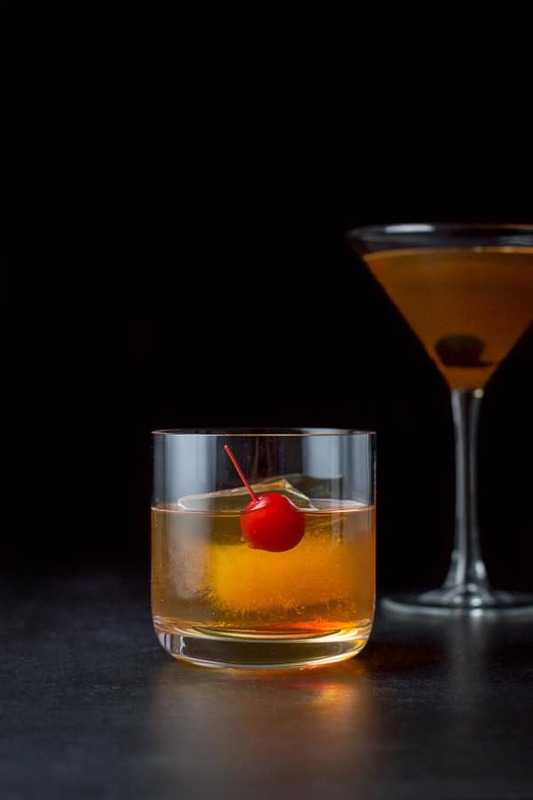 If you’ve tried this Bourbon Manhattan recipe, I’d love the know what you thought about it in the comments below. I love hearing from you! You can also FOLLOW ME on FACEBOOK, TWITTER, INSTAGRAM and PINTEREST to see more of my delicious food and delightful cocktails! Buy the best bourbon you can afford. To me, you can taste the difference when you make a cocktail with a premium liquor or what we called "top shelf" in the bar where I used to work. It's especially important in a cocktail like this since there are basically only 2 ingredients. That means you can more easily taste the difference. If you can, get some fun bitters. I purchased Woodford Reserve flavored bitters. The package arrived with 4 different flavors: spiced cherry, orange, aromatic and chocolate. I've used them all and they're delightful, but my favorite is spiced cherry. 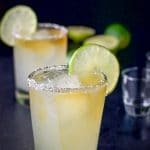 This recipe calls for 5 drops for two cocktails, but I usually use 10 for two drinks. You need to play around with the amount of bitters to see what suits you. If you don't have fancy bitters, it's perfectly fine to use Angostura or any other bitters. Whenever I use maraschino cherries as garnish, I rinse them off so the juice they are stored in doesn't infiltrate the cocktail. Yes, I know you do! Whenever I make a bourbon cocktail, I think of you Vince! A most grown up cocktail! Indeed it is! Thank you Chris! Manhattans are my favorite cocktail because I love bourbon, yes I like strong drinks. I only have one, but when I do, I want my cocktail strong and tasty. Hehe. I’m with you on that one Adriana! Thanks for your comment! Ohh my husband loves this kind of cocktail. I’m usually not a bourbon drinker but I’d make an exception for this! Thanks Liz, it’s so tasty. And if you haven’t delved into flavored bitters – do so, especially if hubby likes bourbon! 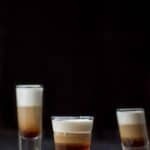 My bourbon loving friend is going to be so excited when I make this for her. 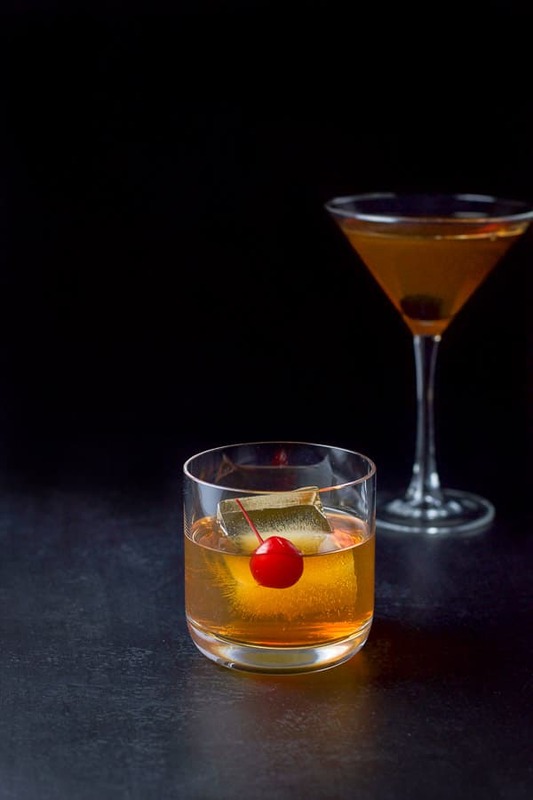 This bourbon manhattan cocktail will also be perfect for serving at any party. Manhattans are so classy! 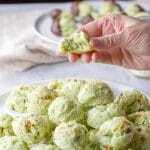 This would be fun to serve at a themed dinner party! Thank you Kristina, and I agree! They are so classy! I am a huge fan of bourbon. I love this cocktail! This is a great one for me to start the weekend off! It’ss almost Friday and I have all the ingredients! Woohoo! Thanks and cheers, Eileen! Thanks for yet another delicious recipe Lainey, I love my bourbon and this Manhattan sounds delish, appreciate all the good tips too, can’t wait 6 p.m. to try it! Hehe! We drink at 5:00pm here in the states. 🙂 Thanks so much Patty!